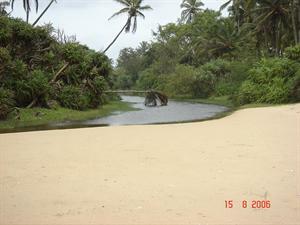 Varca Beach-One of the most beautiful beaches in the region the Varca Beach is situated in Goa. The longest stretch of unpolluted water the Varca Beach is another famous tourists destination in the beach capital of India. A charming white sandy beach with mesmerizing views of nature the Varka is a perfect holiday spot for couples. With beautiful palms surrounding the serenity of the beach the Varka is ideal for dolphin watching, sunbathing and boating.initially a traditional fishing village the Varca Beach houses a number of fishing boats parked on the gleaming sands. Dotted with palm thatched houses of the fishermen the Varka reminds one of colonial India. A true exhibition of Goan lifestyle the Varka houses some of the best restaurants in Goa. Famous for its seafood the shacks and restaurants in Varka are crowded with tourists mostly between November and March. The Varka beach is just a few minutes away from the Dabolim airport. For road transports there are plenty of buses, cabs and auto rickshaws. For intercity travel purposes there are numerous scooters and cycles that can be hired from the locals. Goa being one of the most famous tourist's destinations in India offers a range of accommodation options. Varka offers a number of luxury hotels and resorts that come with their own private beaches. There are also a number of popular budget hotels in the region like Colonia Jose Menino Beach Resort, Bissmark Hotel, Annapurna Hotel and Resort De Goa.